To configure assigned access (kiosk mode), you need the Application User Model ID (AUMID) of apps installed on a device. You can find the AUMID by using Windows PowerShell, File Explorer, or the registry. You can add the –user <username> or the –allusers parameters to the get-AppxPackage cmdlet to list AUMIDs for other users. You must use an elevated Windows PowerShell prompt to use the –user or –allusers parameters. 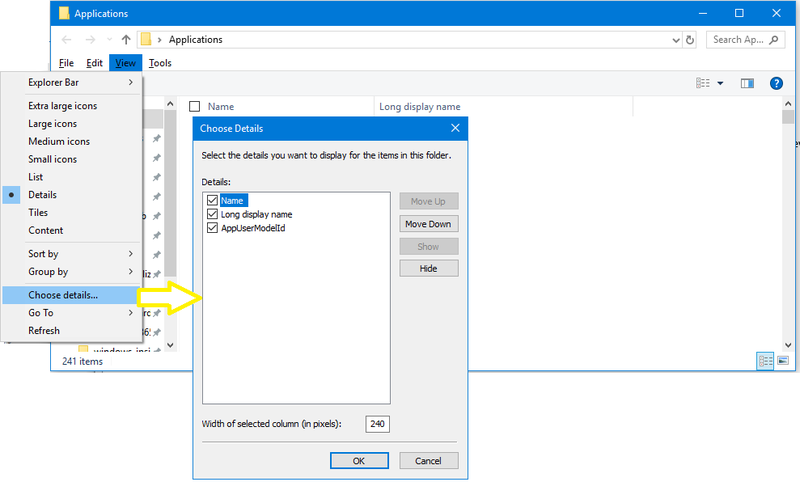 Open Run, enter shell:Appsfolder, and select OK.
A File Explorer window opens. Press Alt > View > Choose details. Querying the registry can only return information about Microsoft Store apps that are installed for the current user, while the Windows PowerShell query can find information for any account on the device. The following code sample creates a function in Windows PowerShell that returns an array of AUMIDs of the installed apps for the specified user.